16-year-old hurdler Ang, Ding Hui earlier at SAA T&F Series 6 earned himself a spot for the IAAF World Youth Championships to be held next year in Donetsk, Ukraine. 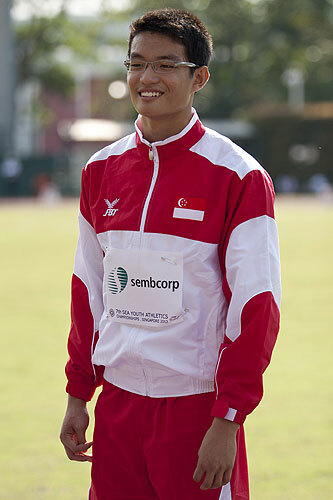 The Raffles Institution athlete ran 14.30 seconds (-1.6m/s) in the 110 metres hurdles event to meet the entry standard of 14.40 seconds set by the organizer. Not only Ang, Ding Hui is fast over the hurdles but he has also represented his school in swimming. He is following in the footsteps of his older brother, Ang, Cheng Xiang who donned Singapore colors at the previous edition of the Championships in 2011 in the same event, and his father who was also a former national hurdler. The IAAF World Youth Championships is a biennially global athletics event is held by International Association of Athletics Federations for competitors who are 17 or younger (youth).